Last spring, the district began the process of evaluating our “brand.” A brand is your customers’ feelings and beliefs about your organization, as well as how you communicate and present yourself to them. A committee was convened to guide the process. This committee consisted of district personnel; community members; and board members. As we began the process, we first identified our “official logos.” Would it surprise you to know we have over a dozen different eagles that we use in various situations? The two most often used are what we call “Count von Eagle” – the one that is used on the website – and the “Philadelphia Eagle” that is in the middle of the football field. 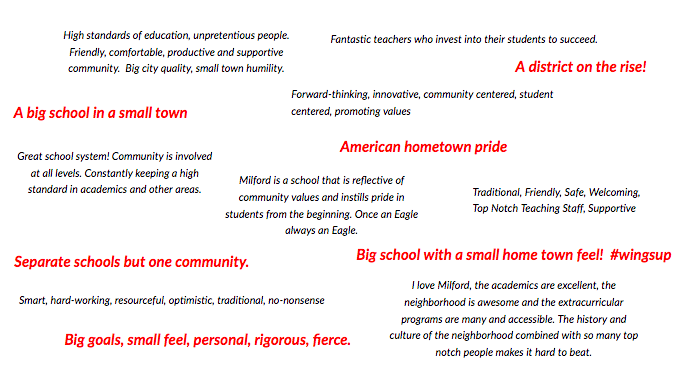 After we figured out how many “logos” we currently have, we conducted a community-wide survey, asking about our current logos; school colors; and what people’s perceptions of Milford are. We had over 1,300 responses – a huge number for a survey of this type (for perspective, the designer working with us usually gets 300-400 responses from school communities!). About half of respondents were not satisfied with the district’s current logo, and over half felt the official logo wasn’t being used consistently (no surprise, since we do not have an “official” logo). Three-quarters felt it was important to have a unified logo throughout the district, and 60% felt it was important that our logo is unique and distinct, and not repurposed from a college or professional sports team. 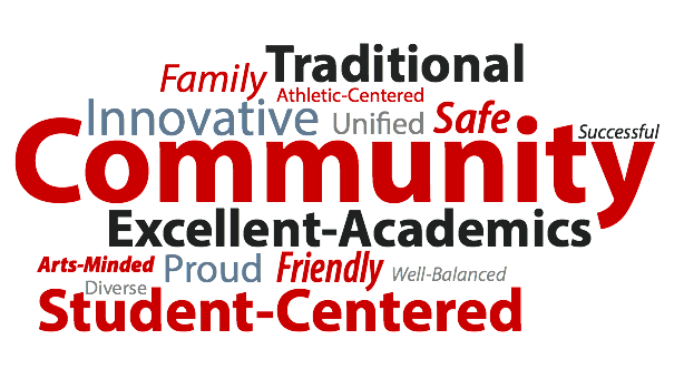 Finally, almost 80% felt it was important to have a new, unified logo that was used throughout the district, and over 90% preferred that the logo for academics and athletics were similar and complement each other. After seeing the survey results, our first step was to understand how many and what eagle mascots are out there. It turns out that 36 high schools in Ohio have eagle mascots, and the majority use a variation of the Philadelphia Eagle, as we have for many years. In addition, we learned that the eagle is the most-used high school mascot throughout the country. We also looked at various options for the Milford “M,” since we wanted it to be as unique as our new eagle mascot. For both our eagle and our “M,” we determined we wanted to meet the elements of a good logo: simple; effective; consistent; adaptable; timeless; and unique. We then turned to an online community of designers who developed logo concepts as part of a “contest.” We had over 250 entries from all around the world! The winning concept was developed by a graphic designer in New Mexico. At this point, we had the general direction, and the designer from our branding agency began to refine and focus it. 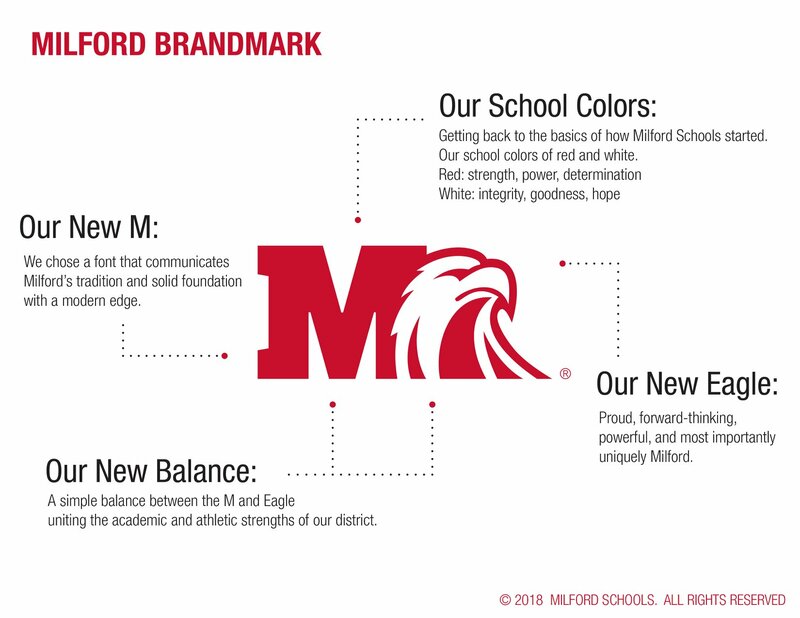 He created a full eagle, the outspread wings, and our own font for “Milford.” We determined how each piece of the logo package would be used, the official district “red,” and options for use by schools and organizations. At the board meeting last week, the board approved the main brand mark, which is the “M” and the eagle head. The rest of the logo pieces will be finalized by the committee and communicated through an official brand standards document. In addition, over the next few months, we will be finalizing our branding statement, which is a description of our values. Because one of our values is that we are frugal and fiscally responsible, you will see the logo phased in to use as items need to be replaced in a natural cycle. We do hope, however, that you take full advantage of the spirit wear that will soon be available to proudly show off our new brand mark! This entry was posted in Celebrations!, General by Andrea Brady Milford School Board. Bookmark the permalink. I’m so happy to see that we now have our in unique identifier. Thank you for the solid and thorough work.